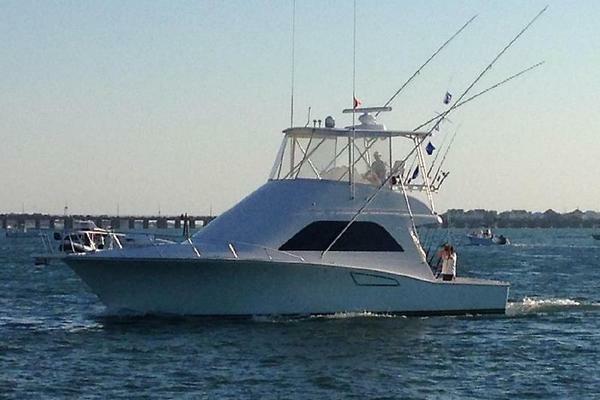 Cashed Out is well kept and a great example of the 45 Hatteras. The 45 was a product of the Hatteras 43 Convertible stretched two feet and most of it in the cockpit, bringing the cockpit to a large 132 square feet, and with the extra 2 feet it's much easier to get on top and much easier to stay on top at lower RPM’s. The 45 turned out to be one of Hatteras’ best selling boats. Cashed Out has been well cared for with lots of upgrades, the boat runs excellent and everything works. A must see Hatteras!!!! Spacious salon with L-Shaped lounge to starboard with storage under, also leather recliner, Hi-Lo Table with storage. Entertainment center, bottle/glass storage. Flat Screen TV with KVH Satellite. Custom wood blinds. Galley is down with microwave oven, large sink, abundant storage, indirect lighting, water and waste tank gauges. Full size refrigerator with upper freezer. Master Stateroom is across from the galley with twin berths, hanging locker, ample drawer and storage under berths. The Full head is to starboard with Vacu Flush head, sink, vanity, storage and separate shower stall. The Guest Stateroom is forward in the bow with large V-Berth, hanging lockers. The original Hatteras Afromosa Teak Paneling throughout the cabin shows in excellent condition. Cashed Out is not just a Hatteras that someone thru money at, but that's been well cared for thru the years and it shows pride of ownership. Fully Serviced and ready to go. A Must See!! !